Somerset 591-9 dec beat Worcestershire 488 and 95 by an innings and eight runs. A poor display from Worcestershire's batsmen saw them slump to an innings and eight-run defeat by Somerset as they were bowled out for just 95. Despite making 591-9 in their first innings to lead by 103 runs, Somerset's chances of securing victory on the final day looked slim. But after resuming on 4-0 the home team were soon struggling on 21-2. 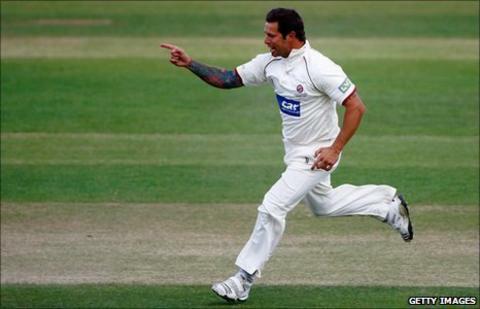 Peter Trego (4-22) and Alfonso Thomas (3-13) ensured that wobble became a full-blown collapse to defeat. Somerset's bowlers made the most of gloomy overhead condidtions as Matthew Pardoe was the first man to go, edging Steve Kirby to slip for a duck. He was soon followed back to the pavillion by Vikram Solanki, victim to another slip catch, this time from Trego's fifth ball of the day. Daryl Mitchell and Moeen Ali looked to be restoring some order for Worcestershire as they built a partnership of 29. Worcestershire posted their highest and lowest scores of the season in the game. But Ali top-edged a pull from Thomas and his dismissal triggered a sudden capitulation by the home side. Jack Manuel lasted just three balls before being bowled by Murali Kartik and Thomas removed Gareth Andrew and Alexei Kervezee as Worcestershire slumped to 61-6. Skipper Mitchell dug in for two hours but eventually went for 26 when a ball from Trego kept low. Any hopes of Worcestershire saving the game disappeared with him as Trego and Kartik claimed the final three wickets for 11 runs. The victory leaves Somerset 23 points behind leaders Durham, while Worcestershire remain rooted in the bottom two. "In many ways we played a lot of good cricket in this game, but it came to a crucial session where we were just not good enough. "It was not easy, we hade three glorious days of sunshine and then suddenly we had conditions that have been well exploited by a good bowling attack. "Suddenly it swung and nipped around a bit and it's a fourth day pitch, which was unfortunate for us but we have to deal with those issues."